The first thing you need to understand about DNS is that for every website there is a registrar, a set of "nameservers", DNS records and a host. In some cases, these things can be provided by several different companies. The registrar sells you the domain. The nameservers are the authoritative source of your DNS records. 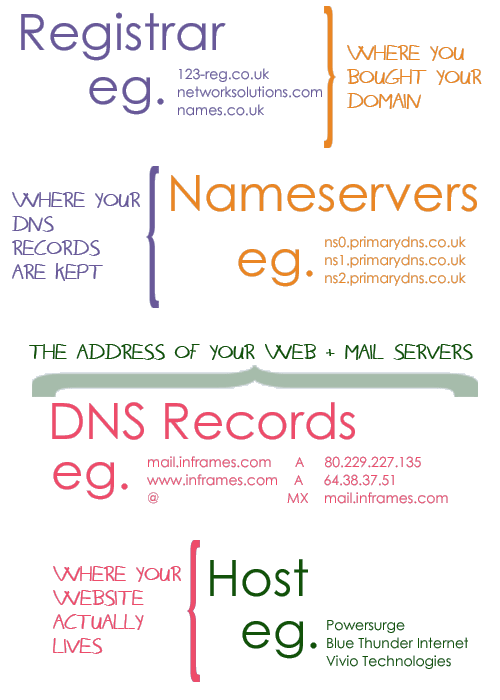 DNS records tell anyone who wants to know that your website is in one place and your mail server is in another. It's like an address book of IP addresses. The host is where your website, email and any other internet services actually live. And again, you can have email and web hosted in different places. When you register a new domain, the registrar will set the nameservers to its own. For example, if you buy a domain from 123-reg, you'll find the nameservers are ns.123-reg.co.uk and ns2.123-reg.co.uk. You can then change these to different nameservers, either (in the case of 123-reg) using a web-based control panel they provide or by just contacting a customer services representative - it varies from one company to another. A registrar should never charge you for changing your nameservers. The same applies for the individual DNS records. You can often control them yourself or in some cases you'll have to call or email tech support. If you find that it's difficult to make these sort of changes, then you should consider finding a more flexible and helpful company to handle your web hosting (hint, hint).